Cork floors are as durable as most other floors. In addition, they are a natural product, environmentally friendly, and produced from a renewable resource (bark of cork oak tree when peeled does not damage the tree). In addition cork flooring is antistatic, sound absorbing, insulating (both heat and cold), and a relief for those with allergies. No other flooring material combines these benefits. When maintained properly, cork flooring can last for generations. The shape of the subfloor is usually the deciding factor. If the subfloor is in poor condition with many cracks, old vinyl tiles or sheet vinyl, grimy or dirty the use of floating floors would be recommended. The use of a floating floor over poor subfloors avoids the need to prepare costly subfloors as long as the floor is reasonably level. Also, if there is any risk of moisture migration from a concrete slab than a floating floor properly installed with a moisture barrier is also recommended. 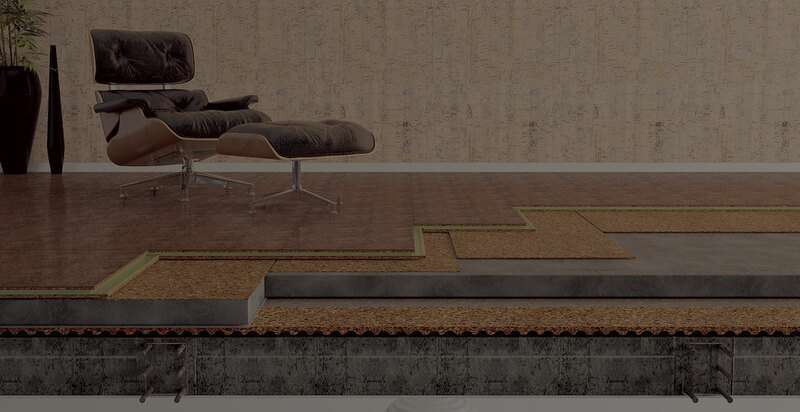 A floating floor is one that is not attached to the substrate. Each plank is secured to those adjoining so that the floor system functions as a single unit instead of as a series of individual pieces. This means that visible signs of expansion and shrinking, normal to any wood product, are severely reduced. Installation of a floating floor is easier, faster and cheaper. Xtreme WRT stands for Wear Resistance Technology – A multilayer UV cured finish that due to its composition of ceramic beads confers to the cork flooring a high resistance to the abrasion, scratches and stains, without changing the natural texture of the flooring. HPS stands for High Performance Surface – This finish is based on the strength of nano-bead technology. HPS® works by embedding a fine shield of nano-beads atop the surface layer to protect and preserve floors from scratches, scuff marks, dents, abrasions, stains, and UV damage. This fine layer of nano-beads has a lower gloss level for a natural look and provides excellent traction to prevent slipping. WRT finish are recommended for domestic and moderate commercial areas. For areas with medium or heavy traffic HPS finish should be used. Yes, it is very comfortable to stand on cork flooring and is easy to maintain. Place area rugs or mats in front of the kitchen appliances and sink to protect your cork floor from a lot of traffic, water spillages, dropping food, grease, and everything else that can cause premature wear of your kitchen floor. Do not drag furniture across the floor. Use felt pads on chair and furniture legs. Avoid moisture on the floor. For maintenance, we recommend regular sweeping and damp moping as dirt and grit can act as sandpaper and damage your finish. Once a year or more frequently if there is a lot of traffic and the floor starts to show some signs of wear, you will want to refurbish you cork floor according to the maintenance guidelines supplied. This will reinforce the protective layer and will restore the original appearance. Warm and soft, cork floors make a very comfortable flooring surface for a bathroom. We recommend the choice of Hydrocork - a 100% waterproof floor which can be installed as a floating or glue down floor. In basements there is a high probability of occasional moisture migration from the slab. Moisture can cause glue-down tile to delaminate and cup. Therefore, glue down tiles are not recommended for this type of application. For basements, we recommend installing a Floating Floor over a moisture barrier of polyethylene. A floating floor is not attached to the sub-floor and will rest on top of the moisture barrier. Yes, exposure to UV light as well as sunlight will cause color variations to cork; typically a yellowing. This is normal and not a manufacturing defect. Area rugs and large furniture will block light exposure and cause uneven coloration. To minimize, furnishings and floor coverings should be moved periodically. Covering large exposed windows will help as well. Yes! Bacteria, dust and dirt do not embed themselves in cork flooring as they do in other flooring options. Simple regular maintenance, such as dust mopping, sweeping or vacuuming keeps cork floors sanitary. Wicanders cork floors are not suitable for exterior applications or installations. Have more questions - please contact our sales team for further information.